Well ! - Hell !!! .......Heeya is some top-class band for your 'Wild West' night ! 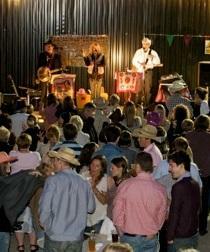 Great for corporate events, parties and BBQs where 'country and western' and 'cowboys' are the order of the day. Virgin Mobile, Cannon, Lloyds, HM Forces, Center Parcs, numerous schools and private clients have been booking this band for years for their Staff Training, team building days, and family fun parties and,NOW ,you're in on the secret as well ! The band performs songs and dances in the modern country rock style mixed with old favourites and catchy tunes that get folk singing and stomping along. And they even have a Caller to guide you through the paces ! Audience participation is encouraged, with 'Miss Dixie' calling fun square and barn dances (OK, even some Line Dances !!) ........and everyone (even Granny !) can have a laugh joining in....... familiar songs and familiar tunes. It's big fun all the way! A great time and a memorable event is guaranteed........You bet ! !